When a moderate south wind began to blow, they thought they could achieve their purpose; so they weighed anchor and began to sail past Crete, close to the shore. But soon a violent wind, called the northeaster, rushed down from Crete. Since the ship was caught and could not be turned head-on into the wind, we gave way to it and were driven. By running under the lee of a small island called Cauda we were scarcely able to get the ship’s boat under control. 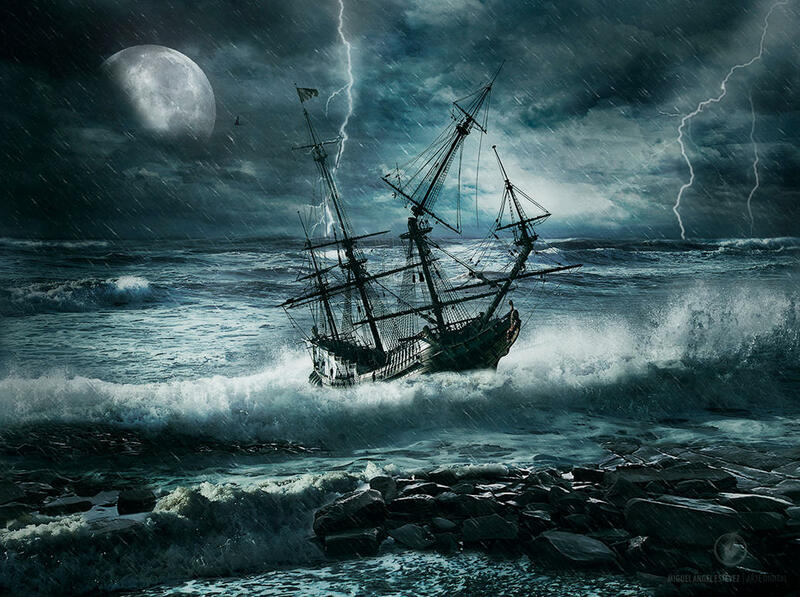 After hoisting it up they took measures to undergird the ship; then, fearing that they would run on the Syrtis, they lowered the sea anchor and so were driven. We were being pounded by the storm so violently that on the next day they began to throw the cargo overboard, and on the third day with their own hands they threw the ship’s tackle overboard. When neither sun nor stars appeared for many days, and no small tempest raged, all hope of our being saved was at last abandoned. When the fourteenth night had come, as we were drifting across the sea of Adria, about midnight the sailors suspected that they were nearing land. So they took soundings and found twenty fathoms; a little farther on they took soundings again and found fifteen fathoms. Fearing that we might run on the rocks, they let down four anchors from the stern and prayed for day to come. But when the sailors tried to escape from the ship and had lowered the boat into the sea, on the pretext of putting out anchors from the bow, Paul said to the centurion and the soldiers, “Unless these men stay in the ship, you cannot be saved.” Then the soldiers cut away the ropes of the boat and set it adrift. Just before daybreak, Paul urged all of them to take some food, saying, “Today is the fourteenth day that you have been in suspense and remaining without food, having eaten nothing. Therefore I urge you to take some food, for it will help you survive; for none of you will lose a hair from your heads.” After he had said this, he took bread; and giving thanks to God in the presence of all, he broke it and began to eat. Then all of them were encouraged and took food for themselves. (We were in all two hundred seventy-six persons in the ship.) After they had satisfied their hunger, they lightened the ship by throwing the wheat into the sea. Confession is good for the soul. It lightens our load. But many times it is lightening our load during a storm – done not for convenience, but for survival. Confession is also the 5th step to recovery and the more thorough we are in taking it, the more healing and redemption we open ourselves to receive. Paul knew, through his prayers for guidance and discernment, that it was unwise to set out to sea, but no one listened to him. I wonder, had he not been a prisoner of Rome at that time, if he would have stayed back and let the others perish at sea. This particular time, he was not given the choice. How often do you find yourself facing the consequences of actions for which you had little choice? Sometimes it may seem unfair to go to God in confession for those sins. Paul led that time of confession for the crew of the whole ship! Many of us have a romanticized vision of Paul, but from the perspective of the soldiers and crew on this prison ship, Paul was a political dissident and a criminal. Perhaps his calm demeanor put them at ease. Or maybe, it made them even more suspicious. She spoke about the temptation to take what we hear from God and immediately share it with everyone around us before we find out how to actually apply it to our own lives. I have experienced this to be true in preaching especially. My best sermons are the ones that I learn to live before I preach them. You have to pray your own prayers of confession before you can lead others in them. And sometimes we have to pray them in the storm, not just when it is convenient. Like Paul, God is not going to save us from all the consequences of our sin, but He will spare us from some of it and He will redeem the situation to show everyone around just how marvelous a God He is.